As the number of Canadians with dementia increases each year, so, too, does the number of assisted living facilities that are incorporating dementia-friendly concepts into their architectural design, decor and programming — all with the aim of keeping residents safe and improving their quality of life. Here, we present three of these noteworthy facilities. Located in the community of Midnapore, United Active Living’s Fish Creek North Assisted & Memory Care residence takes a unique approach to supporting people with dementia. Rather than being segregated based on cognitive or physical abilities (which is common at other older-adult communities), residents with dementia at Fish Creek North Assisted & Memory Care occupy the same floors and shared spaces as everyone else, and they are actively encouraged to participate in the greater community. Director Gail Hinchliffe explains that the aim at United Active Living is to get to know each resident personally, find out what their interests are and help them determine what programs and services might appeal to them. Through an additional service called United Minds, those with dementia or other cognitive conditions have the option of choosing from small group activities or one-on-one interactions, depending on their abilities and interests. Some of the options include Armchair Travel, Movement with Music, Baking and Journey through Art. Hinchliffe says her staff could see a dozen residents with the same medical diagnosis, yet each will live differently with their disease, so it’s important to offer a variety of options — many of which emphasize creativity and the arts. Asked about the benefits of this type of programming for individuals with dementia, Hinchliffe uses the example of an almost non-verbal resident who regularly attends the storytelling group. “If she is in our storytelling program, she absolutely comes alive, almost to the point you wouldn’t know she has dementia,” Hinchliffe says. Another resident, trained at the Royal Conservatory of Music, can no longer identify family members but can still play the piano without much difficulty. “We do see the difference with people having the ability to be part of the overall community and engage with things they’ve always engaged in,” says Hinchliffe. 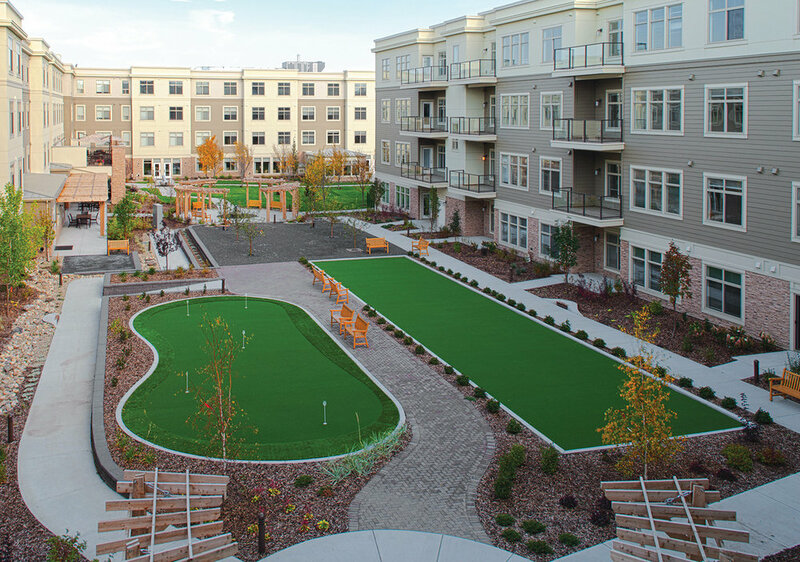 The community also offers a large outdoor space, complete with walking trails, raised garden beds, a putting green and a fruit orchard. All staff, including housekeeping and serving staff, receive specialized training in dementia care. Located in Auburn Bay, near the South Health Campus, the Auburn Heights Retirement Residence offers a 40-room memory-care unit on its second floor. The unit was designed to include several areas meant to evoke a sense of nostalgia and trigger positive memories for residents. radio and coat rack; and a TV screen surrounded by sports memorabilia. At many All Seniors Care Living Centres, including Auburn Heights Retirement Residence in Auburn Bay, residents with memory loss are encouraged to connect with the past through a variety of design elements that nod to earlier times. Photo courtesy of All Seniors Care Living Centres. “I think all of us feel that we have made accomplishments, we have made contributions to society and to our families by the different things we do, and [the items throughout the unit] can trigger memories for [our residents] that are positive,” says Michele Bailey, director of care at the residence. Bailey says the design of the unit can help redirect residents who might be having a bad day. “Maybe they’re emotional for whatever reason, or exhibiting more agitation. We as staff can utilize these vignettes and help pull them out of — or redirect them from — whatever they’re focused on,” she explains. The unit offers a combination of single bedroom and studio suites, each with private bathroom. The residence also allows couples to live together. Individuals don’t need to be separated based on care needs — one couple on the unit recently celebrated their 71st wedding anniversary. In Markham, Ont., individuals with dementia (and their caregivers) who are looking for shorter-term support can turn to Memory & Company Health Club, which offers day programs as well as evening, weekend and overnight respite for people living with memory loss. According to owner and director of operations Ashley Kwong, the 11,000-square-foot facility is among the first of its kind. It can accommodate up to 50 guests at one time and incorporates dementia-friendly design principles throughout the property. This includes the use of soft colours to create a calming effect; bright but soothing lighting; the absence of reflective surfaces; and a circular, open-concept space that helps customers feel less confined. At Memory & Company in Markham, Ont., guests can expect large, open spaces that make them feel at home. Photos courtesy of Memory & Company. Having worked in long-term care facilities for many years, Kwong would often see people with memory loss treated poorly or put in less-than-ideal surroundings. She would also come across families who didn’t want to place their loved ones in assisted living, but felt forced to do so. She vowed to do something to change that. “I knew a lot of caregivers who weren’t ready for institutionalization for their loved one, but didn’t really have many options out there in the community,” Kwong says. Opened in May 2015, Memory & Company offers extensive programming (yoga, tai chi, pet therapy, drawing, gardening, woodworking and baking are just a handful of activities available), and Kwong says some individuals taking part in the various programs have shown improvement in their cognitive assessments. Others have been able to reduce their antipsychotic and antidepressant medications.